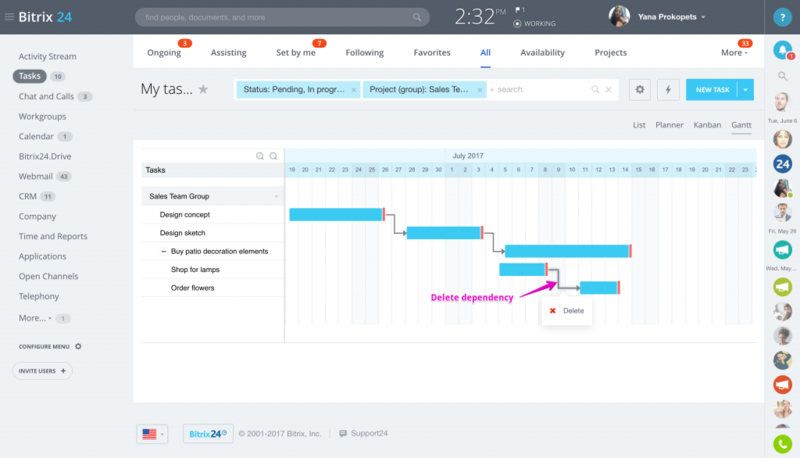 Gantt chart is a type of bar chart developed especially for the purpose of illustrating a project schedule - tasks duration, deadlines, dependencies. 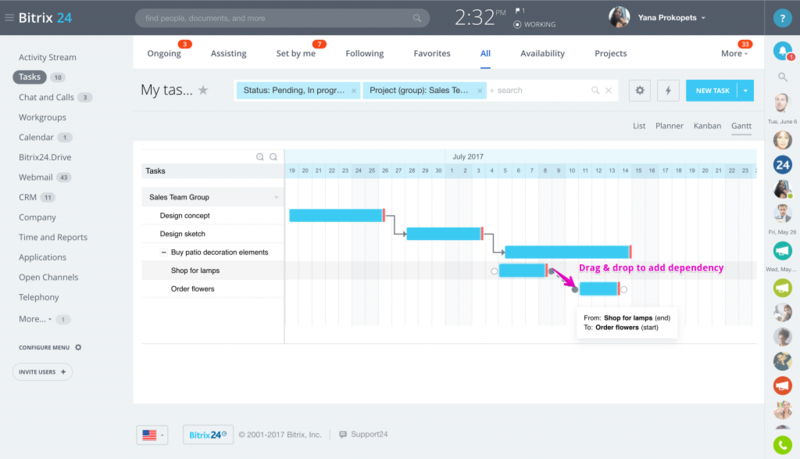 Gantt Chart view is available inside main Tasks section and from Workgroup Tasks as well. 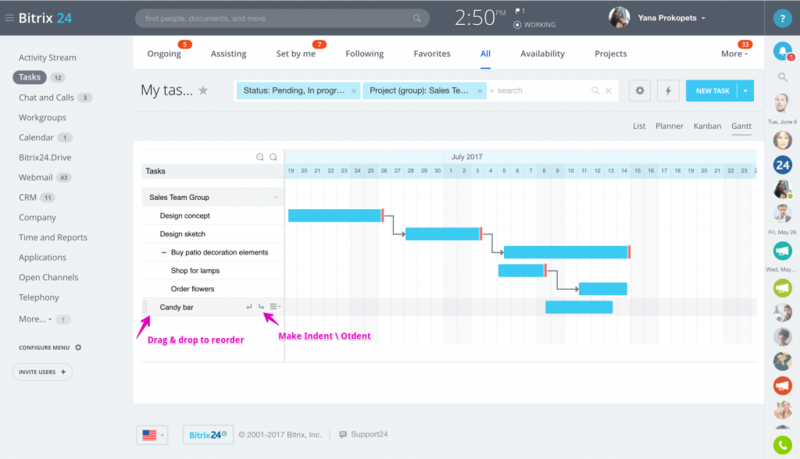 The Gantt charts provide a mechanism for the visual editing of the task schedule. Use +/- tabs to zoom in or out the timesheet view. Start to Finish (SF) – Ex. Parents must return and start taking care of their children again, before babysitter is allowed to finish the job and leave. Each task has own start date, end date & deadline. Start date: identifies when the task should be started; it also influences on the deadlines shift scenario for dependent tasks. 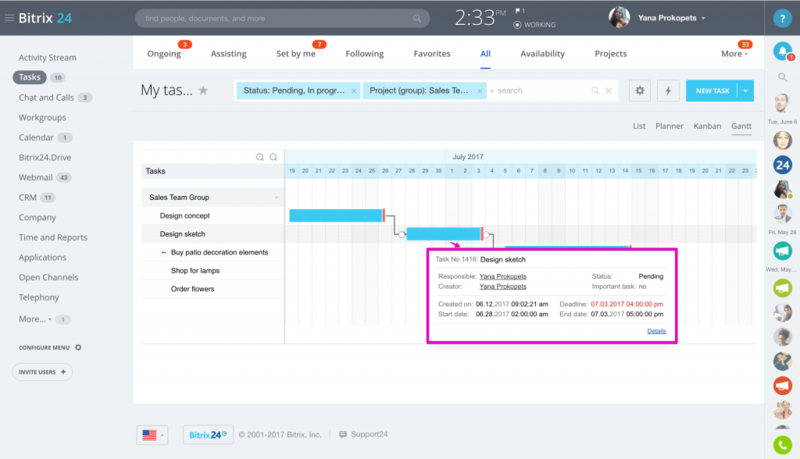 In the Gantt Chart view the start date is displayed as the beginning of the task "blue" block, which can be dragged back or forward. If the particular start date is not set in the task form then the date the task has been created is considered as the task start date by default. End date: identifies when the task is planned to be finished. It also influences on the deadlines shift scenario for the dependent tasks. 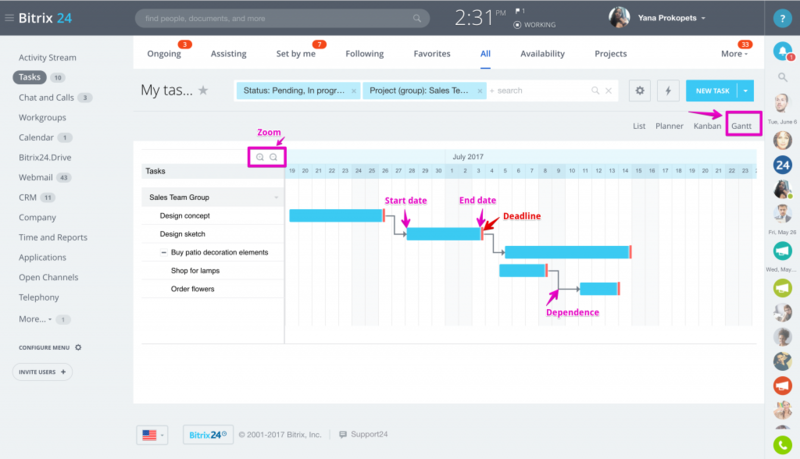 In the Gantt Chart view the end date is displayed as the end of the task "blue" block, which can be dragged back or forward. If the particular end date is not set in the task form then the task "blue" block will be presented in the form of pentagon. Deadline: determines the latest date by which the task should be completed. In the Gantt Chart view the deadline is displayed as "red" block. If the task doesn't have any deadline - there will be no "red" block displayed in the Gantt Chart view. If the task is overdue (deadline is earlier the current date), the overdue period will be marked with "red". 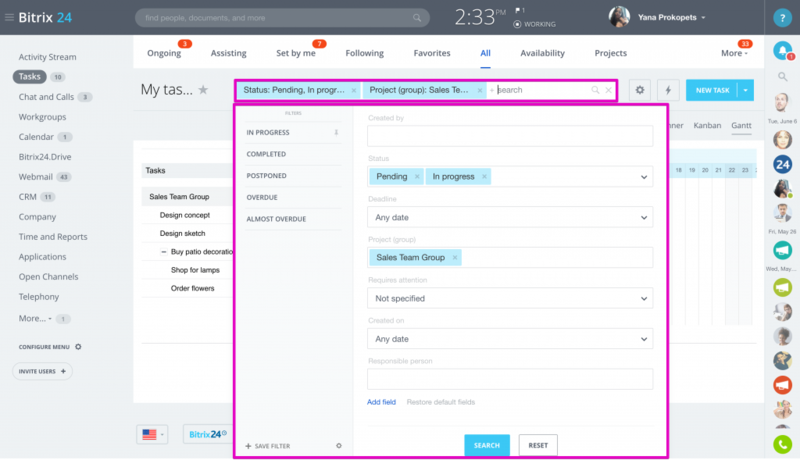 Task Start & End dates can be set inside Task Form - Time Planning section. Task's start, end date & deadline can be shifted in the Gantt chart view with the help of the mouse. 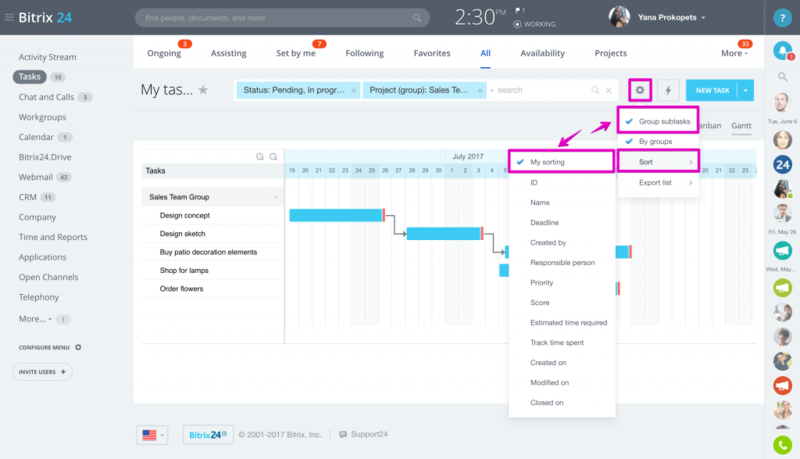 You can move the task start date or end date back or forward separately (drag the sides of the blue task block) or drag & move the whole task block (the start & end date will be moved together with the task block). 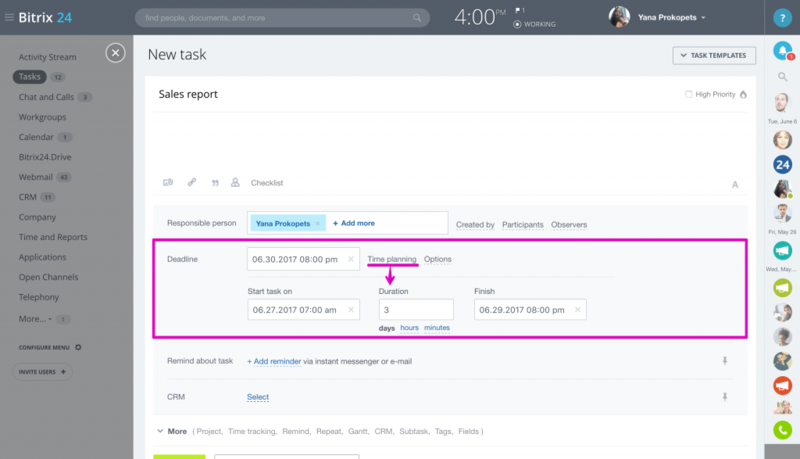 By default the tasks time is not tracked, you need to enable this option inside the task form first (Start Time-Tracker). In this case when you shift the tasks start & end dates the system will check if the new dates are within the configured workdays & hours parameters (e.g. Mon. - Fr. 09:00 a.p. - 06:00 p.m.) - if not, the tasks dates are automatically shifted forward. Workdays & hours can be configured by account administrator in Account Settings. Please remember you can apply filters for the Gantt Chart tasks view as well.